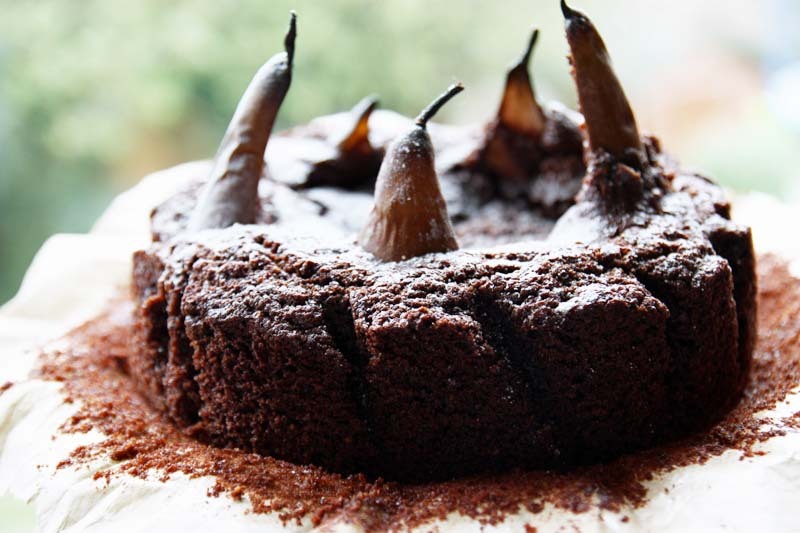 Well I have used up the last of my mothers homegrown pears for this sensational Pear Chocolate Cake. I was so happy with it as it was more than a feast for the eyes. Celia Brooks Brown describes this as a 'Chocolate Upright Pear Cake', I think she could have easily called it 'Chocolate Pear Crown Cake' as that is what it looks like when you bring it ceremoniously to the table, albeit a rustic autumnal crown! I loved how the pears looked poking out proudly. The pears also look great when you cut into the cake, revealing a caramel coloured glacé underneath. Although cocoa and almond flavoured, this is not an overly sweet cake which I must admit I appreciated. Serve this cake with cream or ice-cream. I am sharing this with Chocolette and Chele who are celebrating one year of the We Should Cocoa Challenge. The theme for September is to create a chocolate masterpiece to celebrate a virtual birthday party. I thought to myself well this glorious crown cake would fit the criteria perfectly. I've had fun participating in We Should Cocoa the past year, submitting sweet recipes such as Chocolate and Lime Halva; White Chocolate Banoffee Roulade; and more recently Courgette and Apricot Muffins - So I want to say Well done to both Choclette and Chele for bringing We Should Cocoa to blogland; and may there be many more in the years to come. 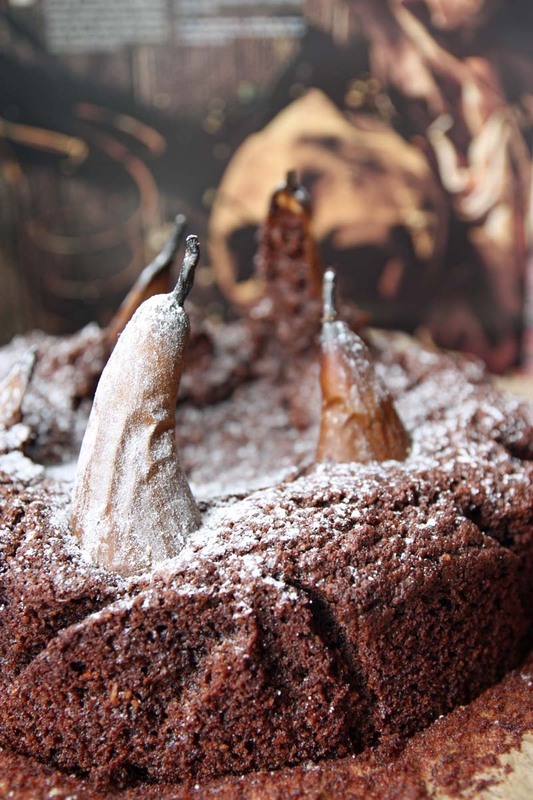 I often post adapted recipes from cookbooks and I know Celia Brooks Brown would not mind me sharing the recipe for her 'Upright Pear Chocolate cake', but this time I want to encourage you to treat yourself to a copy of Celia Brooks Brown book New Urban Farmer; or at least borrow it from the library. I have cooked a number of recipes from the book, including the most delicious Rhubarb and Lentil Curry and Chard and Sorrel Kuku; and for those of you who still have a load of green tomatoes, well she has an excellent recipe for Green Tomato Curry too. That looks absolutely fabulous! I have been meaning to make a pear and almond cake all week with some pears a friend gave me and now I find that you have been channelling similar thoughts. This cake is a marvellous celebration cake. That is so pretty! I have never seen a cake like that before! I love the idea of the pears being whole inside! Fantastic Shaheen - a most fitting party piece indeed. I love the crown effect. Not so good for us vegetarians, but it reminds me of a Cornish stargazy pie. I shall check out our library and see if they have a copy of any of Celia Brooks Brown's books as I know you rate her and of course I want to find out how you made this cake. Thanks for bringing it along to the party. 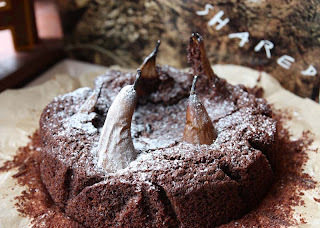 I love this rustic looking chocolate cake; proper home baking! It reminds me of the nursery rhyme 'sing a song of sixpence' with '4 and 20 blackbirds baked in a pie'. Your pears look like slender necked birds! This looks amazing! I think I say that about a lot of your recipes, but the presentation of this cake is cafe-worthy. Wonderful. Oh my, what an unusually beautiful cake! I love the pears sticking out of the top. You're right. It does look like a crown! I'm sure it tastes fantastic too. I love that it's not too sweet. Yum! Wow, what a show-stopper! I'll have to keep an eye out for the book, the recipes you mentioned make my mouth water! I look forward to seeing your pear and almond cake - its a good combo indeed. Thank you so much Choclette. Your rigt about it reminding us of the Cornish stargazy pie as that is what I thought when I started inserting the pears in. I hope you find a copy at your library. I'm lookign forward to see what your other readers bring along to the party! Thank you Charlotte Aimée Clarke. It really is rustic. I didn't put in the parchment paper neatly, so it has a ruffled effect too! I like that it reminds me of the nursery rhyme 'sing a song of sixpence', much better than 'stargazy pie'. You do, but it is always appreciated :) and humbles me every time. I'm esp. liking 'cafe-worthy' as that is my style of cooking - homely and down to earth. I'm so pleased you like it. Please do keep an eye out for the book. I think I have all of Celia's book, even her very first one that is out of print (which she self published). I'm envious of your recent acquisitions, esp. the new River cottage Veg book - even though I am a bit dubious of HFW reasoning behind going all veggie mad - why don't he just admit it, he wants to rake in the veggie and vegan $£ too (the way he did the meat eater £$ with his book 'Meat'). Still on the positive he is encouraging meat and two veg people to eat more veggies - sounds like my blog actually as that is what I have been trying to do too (without overtly being vegetarian). Oh I actually have Sundays at Moosewood - it was the first Moosewood Book I ever bought after being intro'd to them by my best friend in America (who I met in the U.K at uni). I hope you enjoy cooking from them both. Much love to you to, mydear friend! This cake just makes me smile. Thankyou for the image - now off to seek out the book....! What a wonderful looking cake! For some reason it looks like a cake that would beautifully fit in a party attended by wood elves, dryads and the like! I think maybe it looks like it grew out of the earth or something (I meant that in a good way! ), especially with the pears that make it look like a crown. If I were a dryad or wood elf, I'd like to have this for my birthday cake! That is BEAUTIFUL Shaheen, and so regal looking! 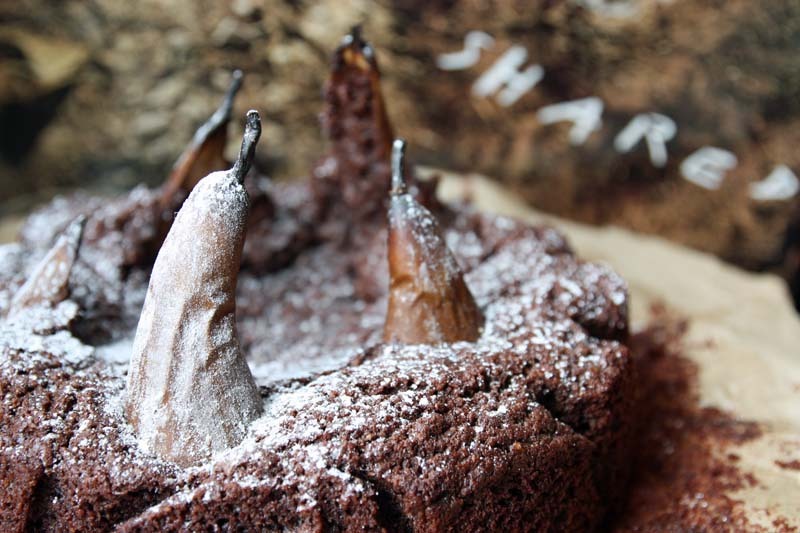 I love the way the pears stand up in the cake, how inventive. A wonderful recipe to celebrate the We Should Cocoa challenge. I'm so happy to read that this cake made you smile. I do hope when you find the book that you like it. Oh Sumaiyyah - what a fantastic compliment. You have made my evening. I would ever had thought of the forest reference, but its so true that I can almost imagine the characters you describe. If I could, I would have happily made one of these for you - just as a Thank You! Its a very clever idea and a lovely cake. And one I have been so pleased making and eating! I do hope they like it at the We Should Cocoa celebrations. Wow - this is just fabulous Shaheen. Such a great way to use pears. Who would have thought they could look so good - it's a work of art! Thank you so much Duchess declutter. Thanks for stopping by my blog. I saw what you write about and HAD to come see more! Thank you so, so much Nicole. I'm really glad you did. This is really impressive and, drizzled with cream, this would be my idea of heaven! I have a chocolate and pear recipe to try this weekend - I hope it looks this delicious! Oh wow! 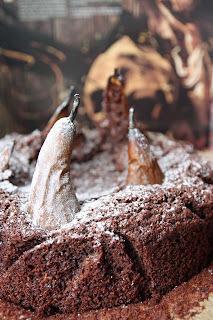 What a delicious looking cake- I love the unusual aspect of the pears standing upright! Beautiful cake! I love the look of the pears too and I'm sure it tasted fantastic. Thank you Kate and Baking Addict. Just came here, at Kath's nudging, what a fabulous cake--it is indeed a crown. wow! Thank you so much Nancy for both coming by and your lovely comment. I will be visiting Kath soon, I've been away the past week - so it will be time for blog catch up this weekend.